Allahumma Swalli Alaa Muhamamdin wa Aali Muhammad…Meded Ya Rijal Allah..
Until the appearance of Sayyidina Mahdi (A.S) ,we are keeping the people busy.After the appearance there will be a great opening. 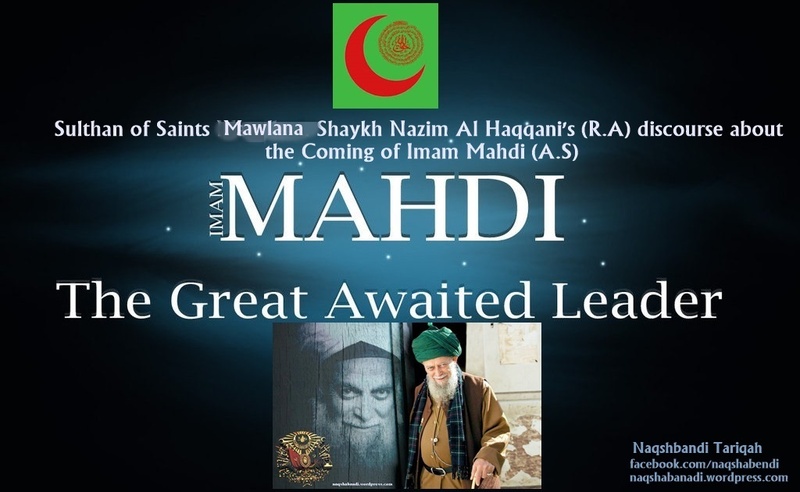 Mawlana Shaykh says that, the appearance of Mahdi (A.S) will be soon and there is only one war left. It is called ‘Al Malhamatul Kubra’, it is the big war Armageddon. It is mentioned in other Holy Books as well. It is said in the Hadith: ‘The world will not come to an end until two great powers fight together. A great war must take place between two great powers and their ideology is the same. The world is going in that direction. It is being prepared to go on that direction.Now, we are in the era of tyrants, the period of ignorance. The Prophet (peace and blessings of Allah be upon him) asked by the companions, “Ya Rasool Allah, There is a verse in the Quran about you, “Innaka Mayyitun wa Innahum Mayyituna” (39:30), You are going to taste death, everyone is going to taste death, it means who have souls will taste death. The Sahaba asked: “who is going to lead the nation after you”? “After me there will be Caliphs”(in the Book Jami Saghir) It will be in turn. After me Caliphs comes, who are Caliphs? The four Caliphate,Sayyidina Abu Bakar, Sayyidina Omar, Sayyidina Usman Sayyidina Ali (May Allah Sanctify their Noble Souls) after Hazret Imam Hussain (R.A), it is finished. The Sahaba (Companions) asked, if the judgement day comes after that?. He says there more, who will lead your ummah (nation), after the deputies (Caliphs) will come “Umara” (Emirs), Emiri dynasty and Abbasid dynasty. Amir Al Mu’mineen Harun Al Rashid for example.Abbasid in Baghdad,Amawi in Damascus. After that Judgement day will come? Who is going to lead the Ummah? After the Emirs will be Kings. They are the Ottoman Sultans. They will rule the Islamic nation. After that, who comes? After the Kings, there will be tyrants. Tyrants , they reject Islam and they reject Shari’ath!. Tyrants who opens a door to the unbelievers. It is the time of tyrants that is coming. When Prophet Muhammad (alaihiswalathu wa salam) informed the Sahaba about what the Muslims will go through the time of tyrants to the Sahaba, they cried. Now, the incidents in Egypt, Libya what people experienced,the tyrants, they opened the door. After Sultan Adbul Hamid, it was opened to the tyrants (1925 AD). There was two things, I don’t know if you saw it in Topkap Palace?. You see two circles when you go inside. That two circles look like the Sun.Every Sultans name is written in it. With Sultan Abdul Hamid’s name, the circle was full. From the beginning of the Ottoman Emperors up to Sultan Abdul Hamid, the first circle was filled, there was no place for Sultan Rashad. He cried and he said, put another one, they put first name Sulan Rashad in it. He was the first Sultan without the power of absolute monarchy, but it was a constitutional monarchy with limited power. It is the tyrants and dictators time,all of them are enemies of Islam. All these tyrants will go against religion. Sahab cried when they heard this cruelty and injustice in this time. The Sahaba asked: Is the Judgement Day during this time? The Prophet (alaihiswalathu wa salam) said: no,then will come a man from my lineage,and he is the owner of time Mahdi (A.S). he will fill the world with justice as much as it was filled with injustice, he is going to finish off the tyrants and fill the world with justice. Now, the way belongs to him. All of these tyrants. “Wa Khaba Kullu Jabbarin ‘Anidin” (Quran 14:15). All the tyrants, every stubborn tyrant will be defeated. This is the verse in Quran. They are both tyrants and stubborn dogs. This will end,. After that, Sahibu Zaman comes and finishes them he will raise the flag of Islam from East to West. All world becomes Muslim. Now we have reached this point. He started to rip out where ever there isa tyrant. Where ever there is someone who rejects Shariath they are finished. (Means the trap of Mahdi alaihissalam is set against every tyrant, hypocrite and oppressors). If we speak till the morning, it won’t finish. Guest asked: Is he (Mahdi) alive? Guest: Is he in Turkey? Mawlana: There is no Awliyas (Devoted Saints/Friends of God) in Turkey, even in cemeteries. They are transferred to Damascus. They are transferred because of tyranny!. There are Awliyas to guard the Ummah in Turkey. There are seven Awliyas, nobody knows them. Seven Awliyas they hold it, there are people in Turkey to be guarded. Now, we hope that, there is movement, there is events taking place, but as the movement intensifies, Hz Mahdi’ (A.S)’s appearance comes closer, the whole world will be in a chaos. they call it ‘Armageddon’ (Al malhamathul Kubra), it has to happen first. And when it happens, Hazret Mahdi (A.S) says “Takbir” ,, “Allahu Akbar, Allahu Akbar, Allahu Akbar Walillahil Hamd” when he says this, all of the weapons stop.technology will stop, the technology that the world worship will stop. With one Takbir, it will be finished. I am waiting for that. The movement started. This movement started like socks ripping of. Like this, taking out of thread from old socks. It will be finished, there is no second chance for the tyrants. Qaddafi is struggling, Their effort is useless. When an animal’s throat is cut , it struggles.you think it is alive. His (Gaddafi’s) effort is futile. There is no conclusion,even if he shoots half the population, he is going to be shot at the end. It is finished. Now, there are many countries as far as we know and we are informed Mahdi (A.S) must appear in Hajjul Akbar in Kaba, and this year we have Hajjul Akbar. That’s why they ask permission for Hajj, I don’t have authority to say anything, until we reach Ramadan, don’t ask me during Ramadan, they inform me, ether to go or not. They did not give me permission. If you want to go from your own. I cannot say until Ramadan, the situation of the world is not clear. When Mahdi (A.S) is seen in Arafat, he says Takbir and he finishes it. This is my hope, I have been waiting for Mahdi (A.S) since 1940.I am waiting for 71 years. It has been 71 years that we have been waiting for Mahdi (A.S).